I finished up One Hundred Years of Solitude by Gabriel Garcia Marquez this past week and I thoroughly enjoyed it. Read more about it at my reading blog. Because there is nothing to read in the house (if you have seen my house, you would be laughing uncontrollably at that statement -- he he), I made a trip to our local used book store, Book Market Paperback Sales & Trading Center in Joliet, and picked up Falling Angels by Tracy Chevalier. This looks to be a quick read, so I'm sure I will be looking for some vacation reading for our trip to Disney world in a few weeks. I want something light, fun, entertaining -- you get the idea. If you have any vacation reading suggestions, please leave them in the comments here or over at Booga J Reads. Thanks so much! I finished knitting Saturday and pinned out Liv for blocking. After a wet towel, some heat and a night of rest, I seemed her up and. . . Here she is! I just threw her on with a pair of jeans, but I think she belongs with a plain skirt or some flat fronted pants. With the split in the front, you don't really want to see anything distracting like buttons or zippers. Kind of takes away from the knotwork. Just a couple of things about this sweater. First of all, I think I should have made the small size. This is a little big in the shoulders and at the sides. I wasn't sure which size I should make and I decided to go larger. Probably not the best thing to do. This makes me think that I should probably go with a small for Ingeborg. Especially since it seems to be an oversized sweater to start with. I also can't decide how I feel about the Silky Wool. At first I loved it. And I still love the color. but I'm not sure about the texture. The cables don't stand out as much as I would have liked. It was also really hard to get this yarn to work with the pattern. I really had to tug on the stitches on the stockinette stitch ridges as I was kntting to keep them tight. The Silky Wool wanted to loosen up terribly. I actually found it annoying as I was knitting and slowed way down on the sleeves because I didn't want to deal with it. Considering this is the first sweater I have completed from a pattern (I did make a sweater last fall from my own design) and the first sweater with set-in sleeves, I think it is pretty much a success. And of course I cast on for the Keepsake Shawl! Pictures coming soon! 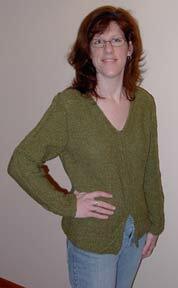 I'm sure you've probably already heard about this, but Wendy started an Ingeborg Knit-a-long Yahoo Group. And speaking of Ingeborg, I mentioned that I bought my Daletta from the guys at ThreadBear, but I forgot to mention what a great price they have for this yarn -- only $4.23 a skein! You can see the model and the price info on Rob's blog. I know the knit-a-long doesn't start until May 15th, and I have a lot of projects to finish up before then, but I am still looking forward to getting the yarn and swatching! And as for Liv. My goal for this weekend is to finish her up. 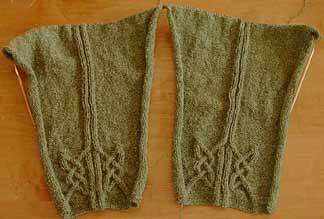 I have the sleeves very nearly completed and I'm doing some of the fussy work on the body. 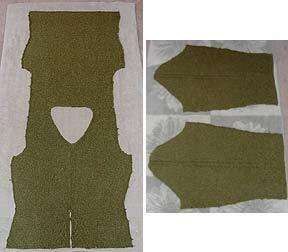 I did a three needle bind off on the shoulders last night and I'm going to weave in ends and block things today. Hopefully I will seam things up tomorrow and have a new sweater by Monday. Wish me luck! Here's a crocheted Critter Knitter's Knit-a-thon blankie. Wendy mentioned crochet yesterday and I had been planning on starting a crocheted Kitty blanket too. So when I saw that she had started hers, I caught the crochet bug. I started it early this afternoon and I just finished it. Crochet is so quick! I am a total beginner when it comes to crochet. I did crochet a blanket for Maddie before she was born and she sleeps with it every night now. It was a small version of a "learn to crochet" granny square sampler thing from Leisure Arts, I believe. And I made that almost four years ago. Needless to say, I needed to brush up. The best place I found online for crochet help was http://crochet.about.com/. They have pictures of the different stitches and step by step instructions. Very helpful. This blanket was made from some more of that Homespun I bought over the weekend. I would have to say that this is about the worst yarn you could use as a beginner. It is so lumpy and bumpy that you can't even see your stitches. Yes, it does hide your mistakes, but you can't even see if you are making them. So, I really didn't learn much about crochet from this project. Next time I will use a nice smooth yarn. I think I have some Encore somewhere in the stash. I believe it's in Christmas-y colors (I was planning to make a christmas stocking from this at one time), but I don't think the kitties will mind. And I will close tonight with talk of a future project. My friends over at ThreadBear just got in Dale of Norway's Daletta. Yep, I'm going to be making Ingeborg. Count me in Wendy! I'm starting a new feature here because I have had a lot of new knitters ask me questions when trying to complete their first Booga Bag. I have a lot of knitting books and I browse through them all the time. On a semi-regular basis, I am going to review one of these books and tell you just why I think you should have it in your knitting library. Ready for my first selection? My first pick is The Knit Stitch (The Knitting Experience, Book 1) by Sally Melville. I'm starting with this book because it is a great beginners book. I wish that I had this book when I was learning to knit because it has excellent pictures for every technique that it covers. It covers the basics (casting on, knitting, holding the yarn, binding off) beautifully and pairs the instructions with simple yet fun projects which will not overwhelm even the most inexperienced knitter. And for those of you trying out the Booga Bag as your first project. There is a lovely illustrated section on knitting in the round. But the best part of this book just might be at the very end -- the section entitled "OOPS!" This was the worst part about learning to knit for me. When I dropped a stitch, I had no idea what to do! Here Sally Melville has illustrated exactly what the mistake is and how to correct it. And I wouldn't recommend this book to beginners only. The projects, while simple, are quite nice. They range from scarves and hats to jackets and sweaters for every season. There are even some funky legwarmers and a nice bag thrown in for the younger crowd. And who couldn't stand to brush up a little bit on their technique. I can already tell that this will be a wonderful reference book as I make my way through the Master Knitter's Program. Stay tuned, I'll be reviewing another book in the next week or two! 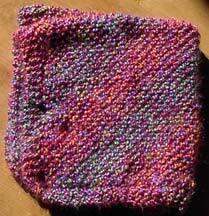 Here's a pretty awful picture of blankie #2 for the Critter Knitters Knit-a-thon. I made a trip to Hobby Lobby this weekend to get some Lion Brand Homespun and some cheap metal circ's so that I could make more blankies. (The acrylic from blankie #1 stuck to the Denise needles that I was using and gave me some nasty wrist pain.) 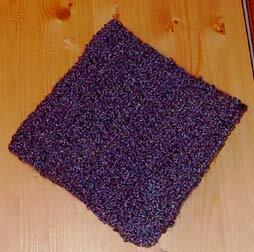 The latest blankie is made using the same pattern as last time and it only took one skein of Homespun. My hands were crying out for some wool after all that acrylic knitting so I cast on for my latest Black Sheep Bags design. It was very hard to capture this color with my digital camera (which wanted to show orange when this is the most delicious pink!) After some re-touching, I think I got pretty close. Does that color say spring, or what? I'm sure I'll be posting more about this one soon. I'm trying to finalize the design and get it out sometime in April. Over at the top of the right-hand sidebar you will see "Charity Corner." Pete was able to raise $1000 for St. Baldrick's to help fight childhood cancer. Now I am joining in with the Critter Knitter's Knit-a-thon. I have donated a prize which is on it's way to Wendy. And I have finished my first blankie! 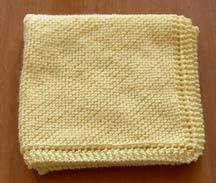 It's a garter stitch blankie knit on the diagonal. I found the free pattern here on the Lion Brand website. And just to prove that I am getting closer to finishing Liv and starting the Keepsake Shawl. . . I leave you with Liv's sleeves. It's so difficult to photograph Koigu and get an accurrate color representation. My digital camera is a couple of years old and it just isn't up to the task. So I went to start the Koigu Keepsake Shawl, tossing aside all guilty feelings about wip's, only to realized that the circular needle I need is currently being used by Liv. Argh! Needless to say, I have been re-inspired to work on Liv and I got a good several inches done on the sleeves this weekend. He did it! Pete shaved his head to help find a cure for childhood cancer. He has raised $910 so far, but you can still help. Just go to his pledge page and you can donate with your credit card. It's quick, easy and it could make a huge difference in a child's life! Thanks to those who have already made a donation! This was a quick knit and I love the finished product. Basically it is just the two yarns -- Squiggle and Tingle -- from my last post held together. I didn't end up following the "pattern" from Crystal Palace. They have you cast on 12 stitches, which gives you a boa effect. I wanted it to be more scarf-ish, so I cast on 15. Then it's just garter stitch until you use up the yarn. 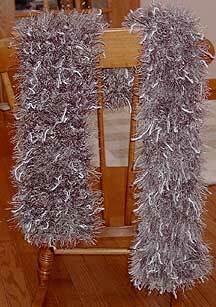 This scarf is for my Mom, but I fell in love with it and I may have to make one for myself. 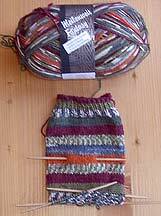 And here's my current sock in progress. This is Meilenweit Fantasy in color 4730. I think it's called Autumn Leaves maybe? I really want to start some new socks using the gorgeous Bearfoot yarn Theresa got me for my birthday, but I should probably finish these first. We'll see if I have the will power! And I updated Booga J Reads since I finished The Da Vinci Code by Dan Brown. Up next -- One Hundred Years of Solitude by Gabriel Garcia Marquez. Theresa, Bonne Marie and I had a great time at ThreadBear on Saturday! This was my first visit and I was just overwhelmed by the wonderful stuff they had. Of course I had to bring some goodies home with me. Today I bring you Koigu. . . 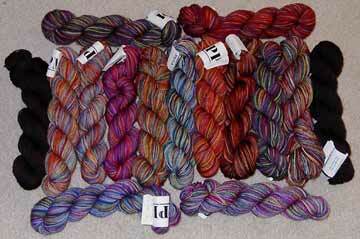 Okay, I know, it looks like a lot, but 12 of those skeins are for the Koigu Keepsake Shawl. I loved knitting my Charlotte and I love wearing it, so I thought it was time to start another lace project using Koigu. I expect this one will take me a while to complete. And here is the Tingle and Squiggle from Crystal Palace. I'm going to be knitting up a funky scarf for my Mom with these two held together using the free pattern on Crystal Palace's website. I'm guessing that this will be a quick knit, so hopefully I'll have pictures tomorrow. As you can see, there is more weirdness going on here. I completed all of the left hand sock and most of the right one with the first skein. 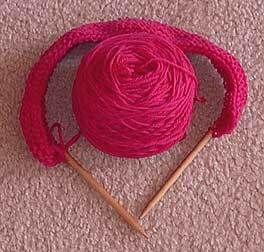 I'm sure you can see where skein #2 began. Although these were from the same dyelot, they are very different. There are colors in skein 2 that don't even appear in the first skein! I want to stress that these were older skeins of Lorna's and were purchased before the current owner took over. 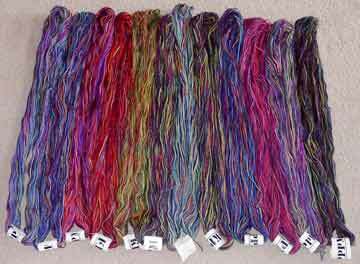 I saw what MotherLode looks like now when I was at ThreadBear this weekend and it is so much more vibrant! I was a little disappointed that I made these socks with the older stuff. But I love them anyway and they are very soft. Can't really feel bad about that, can I? Sponsor Pete & Fight Childhood Cancer! In last Sunday's newspaper I discovered this great cause--St. Baldrick's Celebration, which is a charitable fundraiser which supports the National Childhood Cancer Foundation. Despite great progress made during the past few years, cancer still kills more children than any other disease. The NCCF is a great organization which backs both cancer research and treatment of young patients. In supporting NCCF, we can all do a little bit towards finding a cure. Which is where I (and you!) come in. 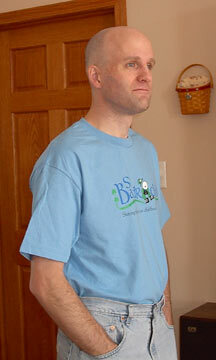 On March 12, the day of St. Baldrick's Celebration, I will have my head shaved at Smith & Wollensky in Chicago. The head-shaving is a symbolic gesture of solidarity with cancer patients, many of whom lose their hair during chemotherapy. I am hoping to personally raise $500 in donations in my name to benefit St. Baldrick's and the NCCF. St. Baldrick's raised over $2 million in donations last year and $3 million since its inception in 2000. Now, those of you who know me personally realize that I'm already quite follically-challenged, and thus will be sacrificing very little hair to this great cause. But, based on the photos I've seen of last year's event, it appears that only clippers are used at the event locations, leaving a thin stubble. I intend to take it one step further, and blade-shave it right down to my scalp. (Hopefully the end result will be closer to Michael Jordan than Scottie Pippen.) I'll post an "after" photo here once the shaving is complete. If you would like to donate, you can do so via credit card through my page at the St. Baldrick's website. Or if you'd prefer to donate with check or cash, just email me and we'll make all the necessary arrangements. For more information on St. Baldrick's Celebration, click here, and for the National Childhood Cancer Foundation, click here.